One of our favorite aspects of this home was that there was an unfinished daylight basement. 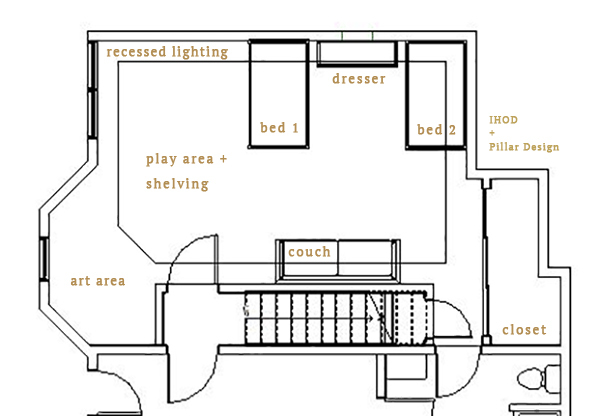 We were hoping to have some large open spaces to work with, so we have plans to finish a shared boys room, laundry room, bathroom, office/playroom, and Gabe’s work space. We are lucky enough to have my mother in law Genevieve of Pillar Design share her architectural design skills with us. We worked with her to establish dimensions and problem solve best layout options for this shared boys room. Here is what we came up with the for the shared boys room so far! 1. Pendant lamps + recessed lighting – Around the edge of the room we are going to use recessed lighting as well as these hanging pendant lamps to create even and warm lighting throughout the room. The boys will have some windows at the front of the room, but a warm even lighting can make such an atmospheric difference in a basement bedroom! 2. Art + posters + panel walls – I am hoping to hang a bunch of the boys’ own artwork above and around the sofa, but I also love adding posters and art work that sparks their imagination. These are just a few that caught my eye so far: Moon print, Let’s go camping, U.S. poster. Also found this tile board paneling that I am planning on putting on one side of the room! 3. Wooden dresser to share – The boys will have a closet in the back of the room, and will share this owen wide dresser in between their beds as well. It was a really good size for storage that can also work in place of nightstands. 4. Area rugs – I love the color and pattern rugs can add to a space and since the floors will be a waterproof faux hardwood, we will be adding a few rugs to warm up the space. The boho dots rug and escape rug are from The Novogratz line. 5. Stackable single beds – These stackable beds can convert to bunk beds, and also has the option for a 3rd pullout bed, so I loved this option. Not really feeling confident quite yet about unsupervised bunk bed time if you know what I mean, so for now they will be double single beds. 6. Faux leather kid proof couch – This faux leather sofa has been in our family room for a few years and has survived everything you could think of. It is so durable and easy to clean, so we are going to put it in the boys room to have a cool place for reading time. It is quite long, so might even use it as a pseudo bed for cousins to crash when they visit. 7. Striped bedding and patterned pillows – I lean towards the classic when it comes to little ones, so I love this striped bedding from Under the Canopy, and I will re-purpose a few pillows around our home to scatter on the couch that are similar to this shibori and this striped pillow. There is also a little open area that we will be putting an art table in since my boys are constantly drawing, cutting, and gluing all kinds of things. I hope it will give the freedom to make messes and encourage them to create. We have left enough open space for them to play their hearts out as well. We will eventually have all three boys share this room so I am hoping it becomes a place they love to hang out together. Side notes: If you are in this same process I would recommend having someone help with renderings and dimensions if possible, to make sure you have an outcome you are happy with. I think I would have been a lost lamb without Gennie’s help. I didn’t realize when we started this process how many decisions you have to make in a short amount of time. The contractors have to know everything from flooring to faucet fixtures to where your electric outlets are going to be, so we spent a good deal of time going over large and small scale decisions before completing the final layouts. Looking forward to sharing the final result soon! I like the sound of the stackable beds. They’re so practical! I love those stackable beds! I love this! I put together a mood board for a shared kids room too and it’s very similar! I might need to steal that camping sign… Love it! Ah fun! They are helpful to make to see how things will look overall! I love the fact that your boys will be sharing a room, my boys do as well. I think even if you have the room for each to have their own (we don’t ☺️) they should share a room, even if only for a while! I think it teaches some good skills on co-existing, patience, etc. Plus the bonus of bonding time, and tons of memories for just them! My sister and I shared a room and even though there where times we wanted to kill each other (no lie) ? I look back on it with a warm heart, smile, and so many cherished memories! I pray the same for my boys and yours too? Also, love the design ideas so far! The couch is perfect! Looks nice and sturdy and something that can transition from little boys to big boys as they grow! Shauna, such a good point. I shared a room with my sister my entire childhood. First half not by choice but it grew our friendship so much that we always wanted to stay roomies even when had the option to switch rooms. There wasn’t a roommate in college I didn’t get along with because I learned how to share a space with many types of personalities growing up with 7 sisters – ha ha! GREAT POST ANNA! WE ARE BUILDING A HOUSE RIGHT NOW AND I’M STRUGGLING WITH WHAT TO DO IN MY 16 YEAR OLD’S ROOM. HE’S ONLY GOING TO BE HERE FOR 2 MORE YEARS (COLLEGE 🙁 AND I WANT SOMETHING THAT’S NOT JUST GUNNA SCREAM “TEENAGE BOY” AND THIS COLOR SCHEME IS PERFECT! I’VE ALREADY HAD HIS BEDROOM COLOR PICKED OUT – STONINGTON GREY BY BM (IT’S THE PERFECT PALE GRAY!) AND THIS COLOR PALETTE YOU’VE GOT HERE SEEMS TO BE A GREAT COMPLEMENT! HIS CABINETS IN HIS BATHROOM WILL BE PAINTED HALE NAVY BY BM AND HIS SHOWER IS A DARK GREY SUBWAY TILE – IC BRITE-GRAPHITE! FLOOR IS A MATTE WHITE PENNYROUND THANKS FOR THE INSPIRATION AND BEDDING RESOURCE! I TOTALLY SEE WHY YOU BOUGHT THE HOUSE THAT YOU DID- THIS IS THE PERECT ARE FOR ALL THREE BOYS TO END UP HANGING OUT IN FOR YEARS TO COME! Thank you so much! I tend to lean towards elements that are interchangeable and not too kid or themed heavy because we move things around so much! So happy this can help you out. Love the sounds of those paint colors. Best of luck girl! Wow, these are all such fantastic ideas! I especially love the idea of a couch in the boy’s room. What a neat way to make it more fun, add character, and provide a place for a friend or relative to sleep!